I've always loved flying. I just don't like airports. But I'll even put up with dancing barefoot through some kind of fancy detectors and setting alarms off to find those long lost coins in my forgotten pockets for a view like this. 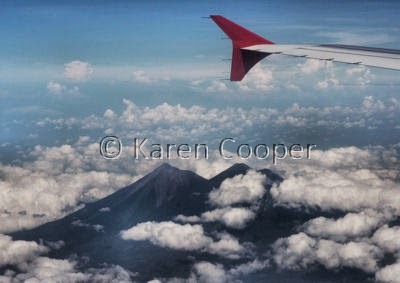 I was lucky enough to fly over El Salvador in Central America, along with a few other countries. Can't really tell where one country starts and another one ends from the air. I like that. Makes me feel like the world really is one place and not a jigsaw puzzle of pieces that man has divided for himself. El Salvador is gorgeous and green. She also has over 20 volcanoes in her wardrobe. Mother Nature seems to have a few tantrums every so often with volcanic eruptions and earthquakes here. From the air, she is stunningly arrayed in ephemeral shades, and touched with the softest white pearl clouds I have ever seen. She has called to place deep within me. I left my nose print on the plane window. She knows I'll be back to taste more of her hidden secrets and beautiful dangers. Nice shot from the plan. Next time I return I wil try that as well. Hi Falcon -- nice to see you here. I used F/13 1/400 ISO 200. Its a beautiful area and worth a whole trip in itself.